Here at Great Rads, we pride ourselves in showcasing the most innovative heating technologies available on the market today. Making sure that we keep tabs on the next big thing in home heating is what keeps us at the height of the radiator game. Whether you’re looking for unique radiator finishes or a quick to heat dual fuel beauty, we always strive for the best here at Great Rads. That’s what keeps us up there as one of the top designer radiator sellers in the country, bringing warmth and comfort to homes across the nation. We strive to utilise our in-depth research and heating know how to bring you the best heating options from across the international market. With so many options on the market, none are more eclectic than the column radiator. With so many different designs on the market, the column radiator boasts efficiency, design flare and maximum comfort, all in one radiator. Coming in a wide range of shapes and sizes, the column radiator is one of the most flexible radiator designs on the market, coming with a tantalising choice of add-ons and extras. With classic and modern designs to choose from, alongside a range of personalised finishes, the column radiator is an eye catching and sleek addition to any property, whatever your interior style taste is. What makes a column radiator stand out? The wide range of designer column radiators available at Great Rads span from the every day to the unique and boutique, giving you great options whatever your price range is. A column radiator usually consists of metal loops through which heat flows, giving space between each loop to radiate warmth. This means that the column radiator has more surface area than the standard panel radiator, which allows less space within the radiators surface area for radiation. This makes the column radiator one of the best examples of how classic, age old designs, can be updated for the modern world. At Great Rads, you can find a wide range of different column radiators. With nostalgic and elegant radiators such as the Boleyn cast iron, you’ll find a range of ornately embellished finishes, bringing Celtic ribbons and other patterns to mark out a classically styled and modern home alike. With more minimalist and industrial designs, you’ll find sharp, stylish radiators which really catch the eye. If simplicity is the name of your game, then check out vertical aluminium and steel options, with a range of striking finishes and matt colours available for your designer column radiator needs. 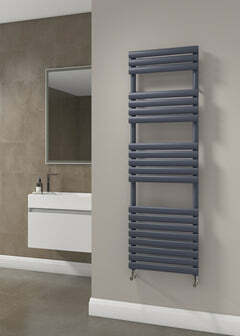 The Square Tube 2 Column Vertical Radiator has lovely square bars running vertically giving a super modern look. 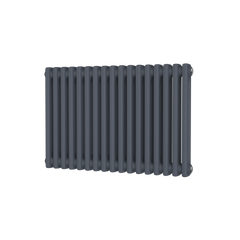 This fantastic radiator has amazing heat outputs, coming in at over 10,000 BTU's for 2 of the sizes. This would look great in any room in your home. 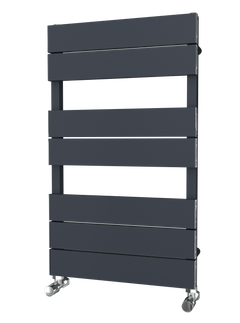 The ﻿DQ Peta 2 Column Radiator ﻿is your modern column radiator replicating the cast iron styles of old but in lightweight mild steel. The design enables it to be used in both modern and traditional settings. This DQ Peta is a beautiful 2 column radiator, with it being able to come in so many different RAL colours and special finishes you are able to make it your own which makes it easy to complement the room of choice. The Tudor 6 - 660mm - Cast Iron Radiator - 6 Column is a very traditional Edwardian type radiator, carefully crafted to offer a versatile choice of heights and widths. The simple column design of the Tudor gives a contemporary feel for the more modern setting as well as an authentic feel for the period home. To assist with how to calculate how many sections you require click on the below links. The Tudor 6 - 960mm - Cast Iron Radiator - 6 Column is a very traditional Edwardian type radiator, carefully crafted to offer a versatile choice of heights and widths. The simple column design of the Tudor gives a contemporary feel for the more modern setting as well as an authentic feel for the period home. If you’re looking to improve your home’s heating efficiency whilst adding an elegant new look suitable for any room, you almost certainly need a Great Rads radiator. One of the best things about column radiators is you’re not limited by size as you can create the radiator to fit your space. Don’t limit yourself by the size and design of your radiator, as there are so many options available to help you make better use of your space. Don’t treat your radiator only as a way to keep your home warm, but as a design statement that reflects the character of your home. Modern radiators are easier to install and maintain than ever. With such a wide range of designs available we’re certain you’ll find one which best suits your taste and home, whether it’s traditional, contemporary or somewhere in between. You’re even bound to find some exciting features, which could help your central heating to blend into the background or allow you to make use of it as a decorative feature. If you’re looking for an amazing collection of radiators, then you’ve come to the right place. At Great Rads, we offer you a deluge of stunning radiators that are ideally suited to keep your home warm and stylish. Our radiators are available in an array of sizes and shapes, so whether you need to squeeze them between your bookshelf or wardrobe, or fit along a wide open wall – you’ll have plenty of fully customisable designs to choose from. Great Rads range of column radiators offer easy to clean, highly efficient and beautifully designed radiators to fit any room. If you’re unsure about what radiator is right for you, why not get in touch with our team of experts to help you make the perfect choice. At Great Rads, you are bound to find the perfect column radiator for your house and we guarantee you that its lustrous and shiny exterior would give your home an ultra-glossy appearance. But, what if your house has space issues? We at Great Rads have got that aspect sorted as well. Now depending upon the available space at your home, you can either opt for horizontal or vertical Column Radiators. Featuring a retro style with all the advantages of modern technology, our horizontal column radiator is a highly energy efficient and classy heating option. This type of radiator offered by us is ideal for larger properties with high ceilings, all credit to their huge surface area. Sourced from reliable and expert brands, you can stay assured that these Column Radiators are a high quality product and have been designed keeping in mind its ease of installation. Additionally, with our wide range of heat outputs and sizes, you can easily find the perfect horizontal column radiator to best suit any house. Merging functionality and style, our vertical column radiator is an exceptional heating option for houses with space constraints. Capable of offering you a stupendous heating performance even in high ceilinged rooms, this type of radiator provided by us can add a classically elegant edge to any property. Vertical column radiator comes in an assortment of models from classic and tall along with slim columns to a modern shorter style along with bold tubular columns. The varied range in shape and size mean Column Radiators can fit in almost any space, so even if you’ve got limited space there is definitely a range for you. We at Great Rads have assembled a great collection of column radiators, which come with a profusion of beautiful hues to choose from that includes Whites to RAL Colours from more than 188 choices. You can effortlessly tailor your search on our website to get the perfect radiator for your house. Where to Install Column Radiators? You must always take out some time to consider the wall where you would want to mount your radiator. Column Radiators are always considered as a superb addition to a house. 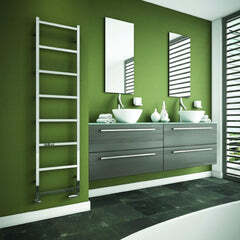 Also, as these radiators can compliment any style and design, you can install them in whichever room you wish to. Of course, finding a perfect radiator for your house can be quite daunting. Moreover, based on the colour scheme and layout of your room it might mean some re-shuffling must take place. But Column Radiators offered at Great Rads, is perfect for every homeowner, no matter how big or small their house is. Besides, these radiators being quite slim line tend to occupy less space and can be mounted on the wall. When compared to those bulky traditional radiators, column radiators are easier to maintain, as its design allows you to effortlessly clean it all the way round the pipes. How to Maintain Column Radiators in your House? Making sure that your radiator is working efficiently is a must, not just for your own comfort but also for your bank balance. During winters, you’ll want your entire house to heat up rapidly and stay that way for a longer period of time. But, for that you must know how to fix minor issues all by yourself, so that your house remains warm and you also don’t have to fork out for an expert. Whilst you require a knowledgeable and qualified expert to install Column Radiators, maintaining them isn’t that hard and most of the tasks don’t take much time to finish. So, this way you’ll only have to call in a professional if things can’t be easily fixed. Besides knowing how your radiator works, you must also know how to bleed them and tackle defects like cold or noisy systems. Great Rads: Why Choose Us? At Great Rads we have many years’ of experience in the industry, business and design. We make use of trade links in order to secure an unrivalled range of handpicked radiators with a diverse price range that would give your house an elegant look. We offer our customers all types of radiators from Column Radiators to bespoke radiators, with a deluge of heat outputs and sizes. Not to mention at Great Rads, we also offer a varying array of stylish accessories. As a fast-growing radiator dealer, based in the UK, we offer dedicated and personal services to customers that we’d like to receive ourselves. You can get in touch with us today to see what we can do for your needs. Feel free to call us on 01803 450330 or simply drop in an email on sales@greatrads.co.uk.